Friday’s opening concert of the Rockport Chamber Music Festival was a gala event—a treat for the eyes and ears. The Shalin Liu Performance Center was as beautiful as ever, and the music sounded wonderful in it. Devoted entirely to the music of J.S. 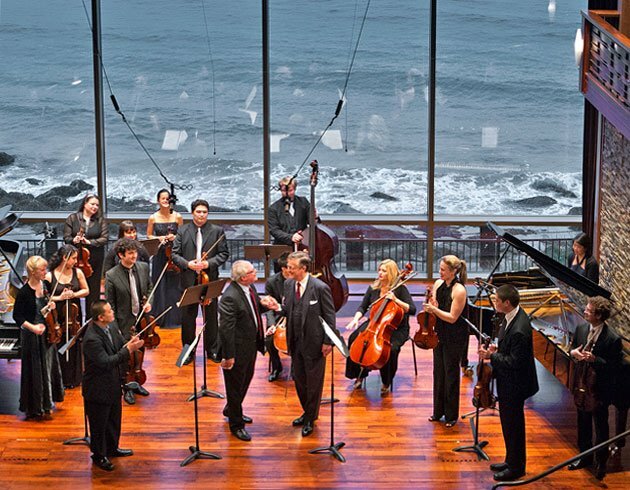 Bach, the program featured two keyboard concertos performed by two distinguished artists well known to Rockport and Boston audiences, Peter Serkin and festival director David Deveau, along with a set of arrangements of Bach’s works by A Far Cry, the energetic young string orchestra that plays without a conductor. What made the event special was that Serkin and Deveau played the concertos, which were originally written for harpsichord, on pianos. You know, those big, black things with 25 more notes than the standard harpsichord and a set of pedals to produce special effects. I was delighted that they chose to do this, and delighted to hear them. For too many years “modern” instrumentalists have been hesitant to perform the music of Bach and other Baroque composers, since they were worried about being criticized for playing it in the “wrong” way or on the “wrong” instrument, as if such things were actually possible. Unfortunately, this has meant that this great repertoire has almost disappeared from the programs of symphony orchestras and mainstream chamber music series, where large numbers of people could hear it. Until recently, that is. The New York Philharmonic presented a Bach festival this season, and other mainstream organizations and performers are slowly but surely dipping their toes back into the music of Bach, Handel and other early composers—and that is a very good thing! It was certainly a good thing to hear this music in the hands of Serkin and Deveau last night. Their fine performances of Bach’s Concertos For Two Harpsichords in C minor (BWV 1060) and C major (BWV 1061) were as polished as you would expect from these excellent keyboard artists. However, it would have been that much more gratifying had they chosen to take advantage of the wonderful Steinways they were using, rather than approximating the worst aspects of the harpsichord by playing with short articulations and limited pedal. As a harpsichordist and long-time advocate of the instrument, I love hearing Bach on the piano—especially when it sounds like one. The same is true for Scarlatti. François Couperin? Well, that’s another matter entirely. The placement of the two pianos on opposite sides of the stage, with the orchestra in between, was also not ideal. Although this created a nice stereophonic effect, it also led to a few problems in ensemble between Serkin and Deveau that probably would not have occurred had the pianos been placed closer together. I also wished for some more energetic tempi; all of them were on the slow and slower side, despite the fact that these concerti are exuberant, secular works in the Italian style. Instrumental ensembles have been playing arrangements of Bach’s vocal and keyboard music for hundreds of years, including many by Bach himself. It has also not been unusual that these ensembles might perform without a conductor, as does A Far Cry. There are numerous examples of both, beginning in the first decades of the 19th-century and continuing throughout the 20th. The arrangements by A Far Cry were quite skillful, but its performance of them was less than satisfying. Topping my list of complaints is the fact that they mixed some good healthy string playing with some of the worst mannerisms that have come to be accepted as standard in early music circles: clipped phrases, limited use of vibrato, and swelling on many notes. None of this has any basis in historical or musical reality, of course, and none is particularly effective on modern instruments with metal strings played by a Tourte-style bow. The performance of the chorales was also a missed opportunity. Given the fact that these four-part masterpieces are positioned at pivotal points in the Passion to make an eloquent and profound commentary on this meaningful story, they might have experimented with interpreting each of them in more individually expressive styles, rather than using the same slow and reverential manner for all. Regarding the fugues and the six-part Ricercare from The Musical Offering, it is a pity that A Far Cry did not make more of the major contrapuntal events and Bach’s mastery of fugal composition, such as his brilliant use of strettos, inversions, and countersubjects, especially since string instruments can often do this much more effectively than a harpsichord. Nevertheless, I enthusiastically applaud the orchestra’s willingness to explore unfamiliar repertoire, and congratulate the Rockport Chamber Music Festival for showcasing Bach on their program. Please do more! Thanks Mark for explaining so clearly why I found this concert boring. Eichler of the Globe seemed to agree, but in more vague terms.